It’s been a week since I got my new toy, and besides being magnificently dainty, I’ve discovered a few wonderful surprises about Apple’s newest piece of consumer gadget goodness. Surprise 1: As lovely as the new gadget is, it still has the same annoying problem as every other iPod and Walkman ever: headphones. They stick in your ears, catch in your coat, and tangle up miserably. Until they make an iPod with wireless headphones (and oh how I cannot wait for this), it’ll remain a problem. But Apple’s at least fixed one related annoyance. With the iPod nano playing, if you pull out the headphone jack for more than a couple seconds, the iPod detects it and automatically pauses the music. I discovered this when I accidentally snagged the cord again and pulled the jack out of the iPod. When I plugged the headphones back in, I noticed the music was paused. I thought it was a coincidence, so I tried it again. Sure enough, you pull the plug, and the iPod pauses. It’s this kind of attention to detail that keeps me an Apple fanatic. The only thing that would make it better would be if it unpaused when you plugged the cord back in. Surprise 2: I’d always found the games on the iPod to be a little lacking. A circular scroll wheel interface may make sense for music and menus, but it’s kinda sad for gaming. But the iPod nano has a game that acknowledges the device you’re holding is a music player. The Music Quiz game plays a random song from your library and presents five song titles – one’s real and rest are fakes. You have to select the real song title in as little time as possible. To spice things up, the fakes disappear one by one until only the real title remains. I love this game. It reminds me of road trips with my dad when I was a kid. He’d play mix tapes and we’d all try to guess the name of each song as it began. Of course, he always won. They were his mix tapes. When we finally have networked iPods in the hopefully not-too-distant future, I can’t wait to play Music Quiz in 2-player mode. Maybe I’d finally be able to beat my dad. 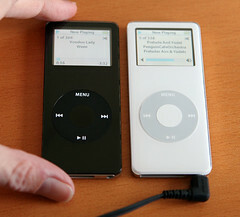 Update: Conscientious readers have pointed out that the Music Quiz is not new to the nano – it’s been included in the last few iPod revisions. But it’s new to me, so I still consider it a pleasant nano surprise.